On the last day of our summer tour we had to change our route slightly. We were planning to visit the place where I grew up and went to primary school … but lots of roads were closed because of the cyclone. I’ll have to bring the camera back another time to show you that. We drove back down the east coast of the Coromandel Peninsula and then drove over the Kōpū-Hikuai Road. 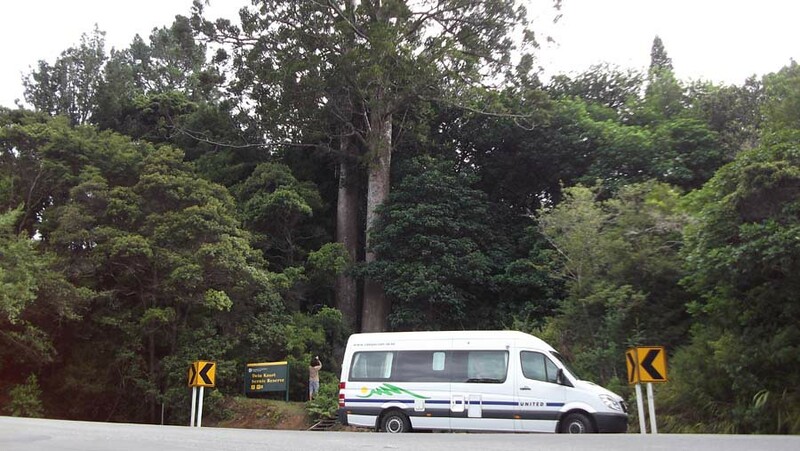 We stopped to have a look at a couple of Kauri trees. Some roosters were hanging out near the trees. Before driving back to Auckland, we visited a town called Thames. Thames was the closest town to where I grew up so it brought back lots of memories. The town was built during a gold rush in the 1800s and for a while it was the second largest city in New Zealand. It’s not anymore. It now has a population of around 6000. This is Thames Hospital, the oldest hospital in New Zealand apparently. 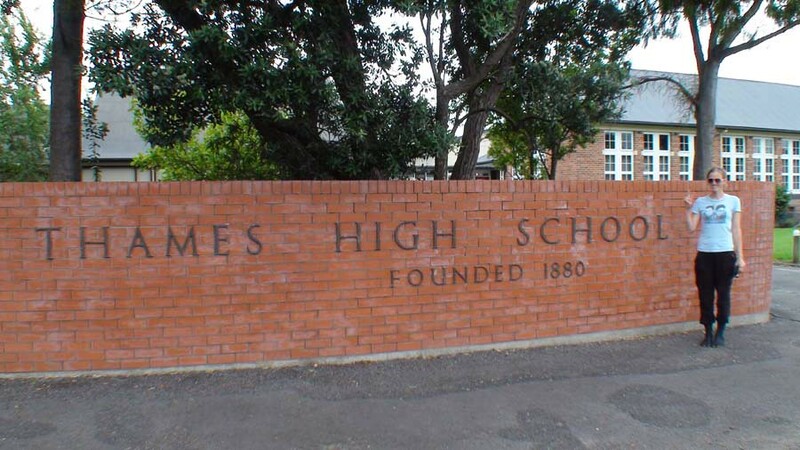 And this is my old high school, Thames High School. 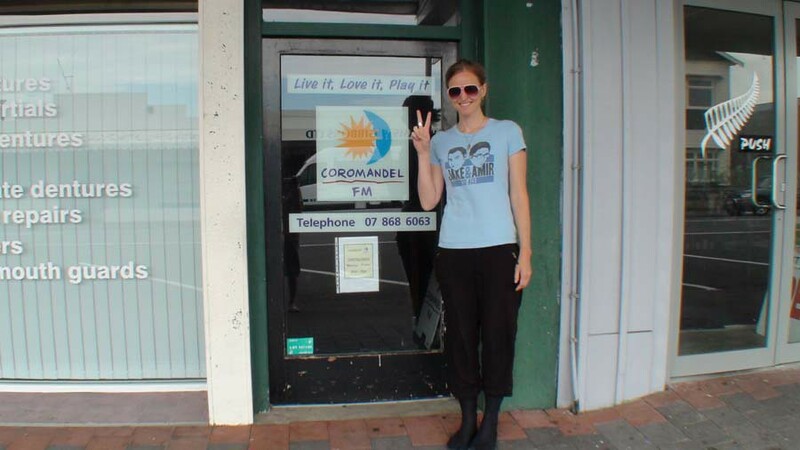 This is the radio station where I used to work. 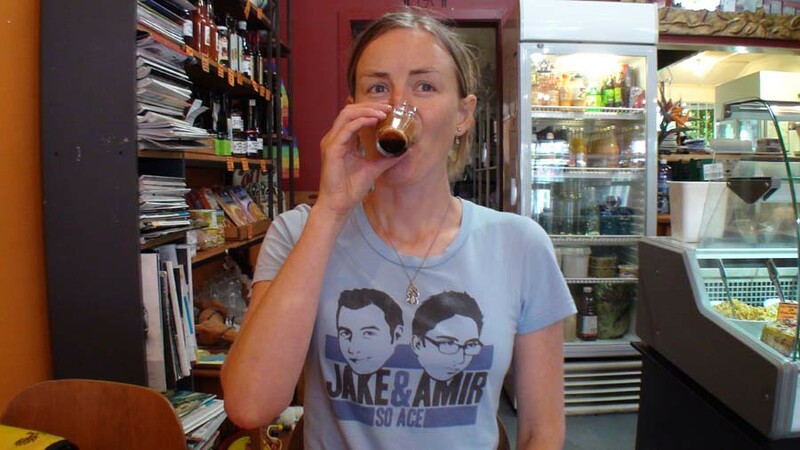 I also worked at this cafe for a while, but it was called something different then. And this bar … and this department store. I’m pretty sure this is where I did work experience when I was in fourth form and I wanted to be a hairdresser. The following year I did work experience here. I wrote news stories on a mechanical typewriter. And this is were I watched the Back to the Future movies. So many memories. It was a public holiday, so lots of stuff was closed, but we managed to find a cafe that was open. They were sellingNingabread Men. We had some lunch and coffee and I caught up on some postcard writing. I sent postcards to Wellington and Colombia. We drove up to the monument where you can get a good view of the town. This is a memorial for people who died inWorld War 1. We left Thames at about half past twelve. Sometimes you have to wait for a long time get over the Kōpū Bridge, so we made sure we had a couple of hours to spare. It only took 5 minutes this time. This bridge was built in 1928. They’re now building a new bridge with two lanes so people don’t have to wait to cross it. The new bridge is supposed to be finished in the middle of 2012. We said goodbye to our motorhome at the United Campervans depot in Māngere. At the depot we met some fellow travellers. We’re from a small town in Forestburg, Alberta, Canada. It’s very small, less than 1000 population. But we’re retired and now we’re living the RVer’s dream. We stay in our RV year-round. We’re full-time RVers, is what we call it. So we stay in our recreational vehicle and travel wherever the whim or the wind takes us. George and his wife took a break from their RV in Canada and travelled around New Zealand for 5 weeks in a United Campervans motorhome. We’ve seen a lot of country and your country is beautiful. It’s very … and the one thing we do find - the roads might be narrow, but your ditches are clean. You don’t have a bunch of garbage and stuff, like a lot of bottles or whatever, paper and trash. We find the country very nice, very clean. We headed home in our little white car and posted the final postcards of the trip … to Wellington, Japan, Vietnam and China.